WOODSETTON PEEP BELL THIMBLE - HMS VICTORY. The thimble has a green band, and is engraved HMS Victory. WOODSETTON PEEP STANHOPE BRASS THIMBLE JS BACH. This lovely thimble has JS Bach engraved on the front. The image though the peep is of Bach's head. I have found this thimble of a website here's the link. Box not included this is a photographic prop. 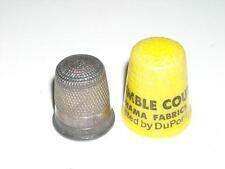 Very Good Condition - Brass thimble with no tarnishing, staining, scratching or deformity. Quite heavy for a thimble of its size. Lutona Cocoa Brass thimble. Condition is Used. Dispatched with Royal Mail 2nd Class. 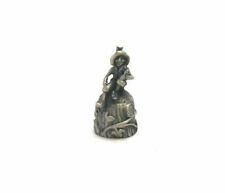 Produced by Woodsetton for the Thimble Collectors Guild. With original certificate TB931 - Feb 1989. Vintage Tailors Thimble Brass Coloured. I'm not sure if it is Brass or not , it's fairly solid so maybe an alloy.In very good condition showing little if any signs of use. It has 1 stamped on it which I guess is the size. Sold as seen. Any questions or extra pictures needed please ask. Please note buyers not in the UK MUST request postage costs before bidding and payments may only be made via PayPal. Thank you. SUPERB FELIX MOREL THIMBLE CRISS CROSS GOLD ON BLACK . 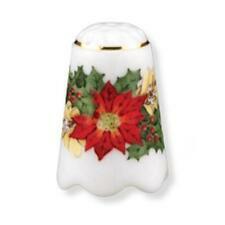 IT IS A GREAT ITEM THAT WILL ENHANCE ANY GOOD THIMBLE COLLECTION. An unusual burgundy leather tooled thimble box made for Fletcher of Belfast. With a cream silk & velvet interior. The velvet is a little dirty from the silver tarnish off the thimble. It is 3.5 x3 cm in size. Leather in good condition except for where the clip to close has torn the leather a little. Does not include thimble. Iles and Gomms Brass Thimble - with original advert and certificate, May 1990 TE033. The end of an era of thimble making by the manufacturer Iles and Gomms. A pretty little thimble probably Austrian.It is made from brass with. a handmade tapestry border. THIMBLE GUILD ~ STEWART GRAINGER 1913-1993. COLLECTABLE THIMBLE. WITH CERTIFICATE. THIMBLE GUILD ~ RELEASE OF TERRY WAITE. COLLECTABLE THIMBLE. WITH CERTIFICATE. Brass thimble with rigged outer. Top is of either fruits or flowers.I've never been sure. 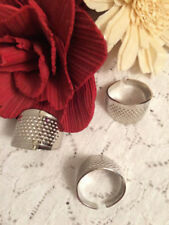 Both Thimbles are in Fine Condition as per photo's. 15-16mm, and weighs 9 grams. RARE vintage porcelain SPRINGER SPANIEL thimble HIGHLY COLLECTABLE. RARE vintage porcelain SPRINGER SPANIEL thimble HIGHLY COLLECTABLE. . Condition is Used but previously been collected and displayed a very rare thimble to source in today's market. Some defect not major small staining underneath nose of dog but not major. Nice items for collector's . 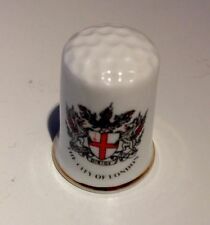 Rare Thimbles are becoming quite rare to find over time Dispatched with Royal Mail 2nd Class. PLEASE SEE OTHER ITEMS SELLING.